DESCRIPTION An attractive three bedroom semi-detached home occupying this generous sized CORNER PLOT within this highly regarded cul-de-sac close to the village centre. Internally the property is offered for sale in immaculate order throughout with accommodation comprising: entrance hall, DUAL ASPECT SITTING ROOM, fitted kitchen with integrated appliances, superb open plan dining room with uPVC conservatory. Upstairs there is an en-suite shower room to the main bedroom and family bathroom. Outside there are two sections of garden with a south westerly aspect to the rear section enclosed with a paved terraced area with a detached double garage with a section providing a separate shower room giving the potential to convert to an ANNEXE OR STUDIO arrangement. ENTRANCE HALL Tiled flooring, wall-mounted thermostat control for central heating, understairs storage cupboard. GROUND FLOOR CLOAKROOM Low level flush w.c., radiator, double glazed window, wall-mounted wash hand basin. SITTING ROOM 17' 0" x 11' 9" (5.18m x 3.58m) From hallway through part glazed double doors, oak style flooring, radiator, dual aspect double glazed windows, TV point, coved ceilings. KITCHEN 8' 5" x 7' 3" (2.57m x 2.21m) Range of wall and base units with integrated stainless steel fan assisted electric oven, inset four ring gas hob with extractor over, one and a half bowl single drainer sink unit with mixer tap, part tiled walls, integrated fridge/freezer, range of eye-level cupboards with pelmet lighting beneath, concealed spot lighting, tiled flooring, kick space heater, uPVC double glazed windows overlooking rear garden, space and plumbing for dishwasher. CONSERVATORY 12' 1" x 10' 0" (3.68m x 3.05m) Brick and uPVC construction, large tiled flooring, TV point, double doors leading to paved terraced area, ceiling fan. FIRST FLOOR LANDING Access to loft space, cupboard housing pressurised boiler. EN-SUITE SHOWER ROOM Low level flush w.c., pedestal wash hand basin, part tiled walls, fully enclosed shower cubicle with fitted independent shower unit, uPVC double glazed window, shaver point, extractor. BEDROOM TWO 9' 10" x 9' 7" (3m x 2.92m) Radiator, uPVC double glazed windows, built-in wardrobe cupboards. BEDROOM THREE 9' 7" x 6' 10" (2.92m x 2.08m) Radiator, uPVC double glazed windows. FAMILY BATHROOM Panelled bath with folding shower screen, fitted independent chrome shower unit, pedestal wash hand basin, low level flush w.c., radiator, part tiled walls, extractor, tiled flooring. DETACHED DOUBLE GARAGE 17' 4" x 17' 2" (5.28m x 5.23m) Above measurement is overall, including the shower room. Twin doors with one up and over door. Currently the garage has been converted with a quarter section of the garage to a shower room with fully enclosed corner cubicle with fitted independent shower unit, pedestal wash hand basin, low level flush w.c., Velux window, uPVC double doors to rear garden, concealed spot lighting. 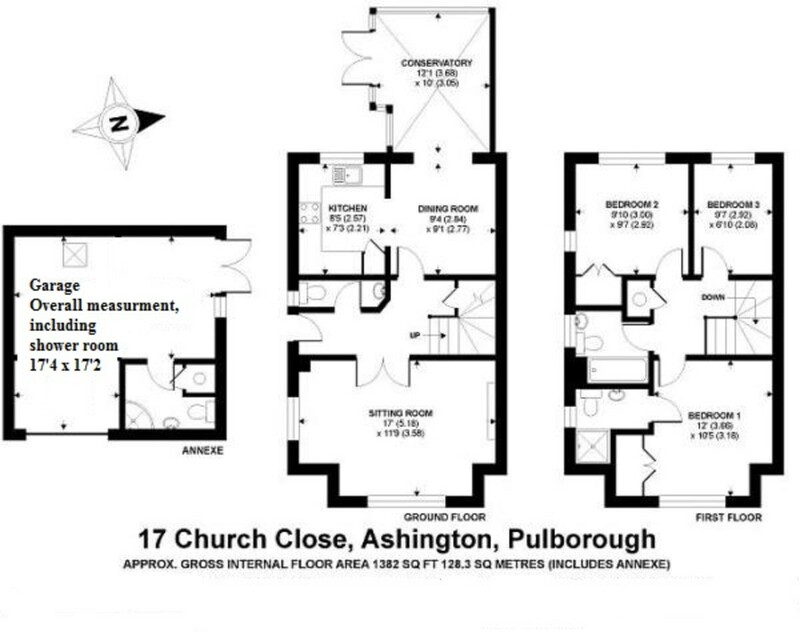 Agents Note: could possibly be converted to an annexe or office, subject to usual planning consents. REAR GARDEN Enclosed paved courtyard area, westerly facing, leading to lawned area with pergola and ornamental fish pond screened by brick walling, timber garden shed garden gate leading through to further side section of garden which is mainly laid to lawn with mature trees, flower and shrub borders.